Second in importance to closing business the most important function of the sales and marketing organisations is ‘demand creation’. Marketing’s contribution to this process has never been clearer. Advancements in technology have enabled marketing to transform from an intangible brand management/lead creation function into a valuable source of qualified opportunities, one measured by revenue generated. The Internet allows the Buyer 2.0 to self-inform long before engaging with the company’s reps. Marketing automation tools give marketers not only the ability to generate demand and educate customers, but also the power to ensure only qualified opportunities reach sales. In light of this new reality, sales organizations must evaluate their alignment with marketing to capitalise on marketing’s new contribution to pipeline and revenue. Marketing is experiencing a renaissance period. The maturity and exploitation of the Internet as a research and communications platform has radically changed how marketing creates demand. Traditional and expensive physical methods of lead generation have transformed into a sophisticated, digital-demand creation approach. Opportunity creation is evolving from the most unstructured, unproductive activity a salesperson does to a measurable, manageable, technology-driven demand creation science that allows marketers to deliver consistent, measurable value to the organization. New methods of digital demand creation allow massive outbound email campaigns to be sent to targeted lists at lower cost and with higher yields than traditional direct mail tactics. Yet random lists of names from email campaigns or events labeled as leads and sent to sales will most likely be ignored, frustrating both sales and marketing alike. All companies also now have legal obligations to ensure that their customer data is correct and to only e-mail people who have agreed to be e-mailed. Consequently, World-Class Sales Organizations are working closely with their marketing counterparts to establish and agree on lead definition levels. Lead definitions set specific qualifications a lead must meet before it is sent to sales for follow up. In exchange, sales agrees to pursue all leads that meet the criteria. Marketing needs to be able to track and score all responses to campaigns. Those that meet the criteria, either by their response or through telequalification, must be passed on to the correct sales rep. The rep is notified through the sales force automation (SFA) platform. Those that fail may be deleted if they are too far outside the ideal prospect profile or put into a marketing nurturing program until they meet the criteria. The metrics associated with leads generated provide insight into marketing’s contribution to the sales pipeline, encouraging marketers to continually improve targeting and execution. Likewise, sales can be measured on follow through of mutually agreed upon qualified opportunities. In another manifestation of the Buyer 2.0 phenomenon, prospects are actively researching markets, capabilities and products. A social engagement strategy along with search engine optimization allows your website to be found more easily by the buyer researching a market, capabilities or specific vendors. Buyers who proactively seek information have already declared their interest in your company. Based on their requests and search behavior on your website, their specific areas of interest are captured. “Buyer enablement,” the messaging and information exchange with the inbound prospect, is another forcing function for sales and marketing alignment. The social broadcast and buyer experience on your site must have a consistent and cascading set of messages that the sales rep can build on. Just as with outbound campaigns, any inbound lead must be qualified and meet the established criteria for a sales lead. Creating demand within an established large or strategic account requires more sophistication and an even deeper degree of sales and marketing alignment. Account Based Marketing (ABM) strategies are focused on demand creation in a large or strategic account and must be created collaboratively between the sales account manager and the marketing team. The account manager develops and shares the account strategy with their marketing counterparts. Together, they develop the ABM strategies, which may include elements such as plans for nurturing future buying influencers, targeting adjacent business units, specific cross-sell or up-sell initiatives, and defensive messaging and tactics to be deployed if the account is threatened. The marketing team then develops messaging and demand creation programs such as a set of modular campaigns. The sales rep can choose to execute these or a custom program if the account or opportunity is significant enough to justify. All of this connects to how we manage our key accounts generally. A great many companies take their key accounts for granted, leavinbg attractive picking for their competition. Large Account Management Process (LAMP) helps to make managing these precious assets simpler. The technology behind marketing’s ability to create, deliver and measure their contribution to revenue and sales goals is the Marketing Automation Platform (MAP) which automates marketing’s myriad responsibilities. 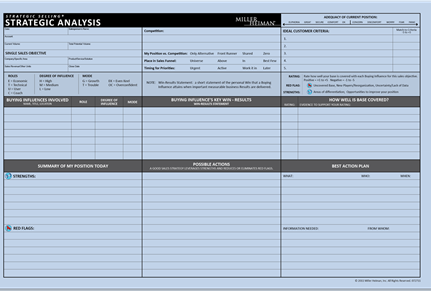 A MAP enables marketers to develop and execute campaigns, analyze their results and manage the data. In addition, capabilities for email marketing, lead management, lead scoring, lead nurturing and integration into SFA for sales lead acceptance are all part of the MAP. For perhaps the first time ever, data produced by the MAP gives marketers visibility into their contribution to the organization. Key metrics for enquiries and lead qualifications levels help marketing optimize future campaigns. Marketing sourced leads that become sales qualified opportunities demonstrate marketing’s contribution to the sales pipeline and revenue. Of course, maintaining the marketing prospect database, integrating external data sources and managing MAP output present new challenges for marketing leaders. These have given rise to a new function in many organizations – Marketing Operations. The marketing dashboard is the interlock between sales, marketing and demand creation, capturing key metrics for inquiries and lead qualifications levels and allowing marketing to optimize future campaigns. Marketing-sourced leads that become sales qualified opportunities demonstrate marketing’s contribution to the sales pipeline. Tracking opportunities that originate from marketing as they move through the sales pipeline to close enables marketing to directly connect their demand creation efforts with revenue. 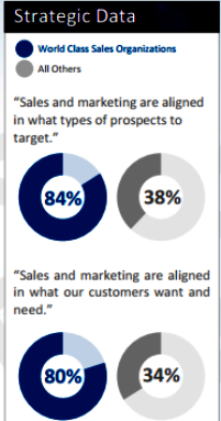 Marketing’s transformation will never be complete without sales alignment. Marketing can no longer operate in isolation. It cannot keep creating what it thinks are leads for a sales organization only to have them ignored because they are unqualified. Sales and marketing need to agree on what constitutes a sales-ready lead, what the sales rep will do with that lead (connect, qualify and engage as an opportunity or return to marketing for nurturing) and the measurements and metrics of an integrated sales and marketing demand creation strategy.